The Easter Lily in its colours of green, white and orange is a symbol long associated with the Easter Rising of 1916 and the Republican Movement. The first Easter Lily badges were designed by the republican women’s organisation, Cumann na mBan back in 1925. The dual purpose of the badge was to raise money for the Republican Prisoners’ Dependents Fund and to honour the sacrifice made by the men and women of the 1916 Rising. A year later, the Easter Lily Commemoration Committee was formed. It continued in existence until 1965. One of its founder members was Sighle Humphreys. The original Easter Lily badge was hand-made by republicans, who sold it often at great risk throughout the country. Traditionally, Easter Lilies were sold outside church gates on Easter Sunday and worn at republican commemorations. In the early years of their existence, people from a broad political spectrum - from Fianna Fáil to Sinn Féin, the IRA and Fianna Éireann promoted the Lily as did non-political organisations such as Conradh na Gaeilge. In February 1935, the Fianna Fáil leadership instructed the party to stop selling the Lily as it was “the symbol of an organisation of whose methods we disapprove”. For its Easter commemmorations that same year, Fianna Fáil introduced a new symbol called the ‘Easter Torch’. This was sold for a number of years but was discontinued as the badge proved unpopular with the party grassroots, many of whom continued to wear the Easter Lily. Since the 1930s and up to the present day, successive Fianna Fáil and Fine Gael administrations attempt to suppress sales of the Easter Lily. 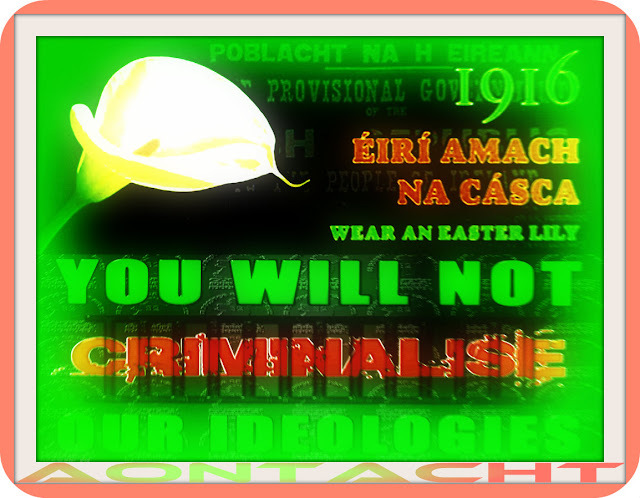 Many republicans have been harassed, arrested and jailed time and time again for keeping alive the memory of the men and women of the Easter Rising through promotion of the Easter Lily. We would encourage everyone, young and old to wear the Lily at Easter as a national emblem that promotes the ideals and principles of those patriots who died in Easter 1916 and the patriots of today who are still fighting the forces of occupation in Ireland’s six north eastern counties. A FHEARA AGUS A MHNÁ NA hÉIREANN : In ainm Dé agus in ainm na nglún a chuaigh romhainn agus óna bhfuair sí seanoideas na náisiúntachta, tá Éire, trínne, ag gairm a clainne faoina bratach agus ag bualadh buille ar son a saoirse. Tar éis di a fir a eagrú agus a oiliúint ina heagraíocht rúnda réabhlóideach, Bráithreachas Phoblacht na hÉireann, agus ina heagraíochtaí míleata poiblí, Óglaigh na hÉireann agus Arm Cathartha na hÉireann, agus tar éis di a riailbhéas a thabhairt go foighneach chun foirfeachta agus feitheamh go buanseasmhach leis an bhfaill chun gnímh, tá sí ag glacadh na faille sin anois, agus, le cabhair óna clainn ar deoraíocht i Meiriceá agus ó chomh-ghuaillithe calma san Eoraip, ach, thar gach ní, le muinín as a neart dílis féin, tá sí ag bualadh buille i ndóchas iomlán go mbéarfaidh sí bua. Dearbhaímid gur ceart ceannasach dochlóite ceart mhuintir na hÉireann chun seilbh na hÉireann, agus chun dála na hÉireann a stiúradh gan chosc gan cheataí. Níor cuireadh an ceart sin ar ceal leis an bhforghabháil a rinne pobal eachtrannach agus a rialtas air le cian d’aimsir ná ní féidir go brách a chur ar ceal ach trí dhíothú mhuintir na hÉireann. Níl aon ghlúin dá dtáinig nár dhearbhaigh pobal na hÉireann a gceart chun saoirse agus ceannas a náisiúin; sé huaire le trí chéad bliain anuas dhearbhaíodar faoi airm é. Ag seasamh dúinn ar an gceart bunaidh sin agus á dhearbhú arís faoi airm os comhair an tsaoil, fógraímid leis seo Poblacht na hÉireann ina Stát Ceannasach Neamhspleách agus cuirimid ár n-anam féin agus anam ár gcomrádaithe comhraic i ngeall lena saoirse agus lena leas, agus lena móradh i measc na náisiún. Dlíonn Poblacht na hÉireann, agus éilíonn sí leis seo, géillsine ó mhuintir uile na hÉireann, idir fhir agus mhná. Ráthaíonn an phoblacht saoirse creidimh agus saoirse shibhialta, comhchearta agus comhdheiseanna, dá saoránaigh uile, agus dearbhaíonn sí gurb é a rún séan agus sonas a lorg don náisiún uile agus do gach roinn di, le comhchúram do chlainn uile an náisiúin, agus le neamhairt ar an easaontas a cothaíodh d’aontoisc eatarthu ag rialtas eachtrannach agus lér deighleadh mionlucht ón tromlach san am atá imithe. Go dtí go dtabharfaidh feidhm ár n-arm an t-ionú dúinn Buan-Rialtas Náisiúnta a bhunú ó theachtaí do phobal uile na hÉireann arna dtoghadh le vótaí a cuid fear agus ban, déanfaidh an Rialtas Sealadach, a bhunaítear leis seo, cúrsaí sibhialta agus míleata na Poblachta a riaradh thar ceann an phobail. Cuirimid cúis Phoblacht na hÉireann faoi choimirce Dhia Mór na nUile-chumhacht agus impímid A bheannacht ar ár n-airm; iarraimid gan aon duine a bheas ag fónamh sa chúis sin do tharraingt easonóra uirthi le mílaochas, le mídhaonnacht ná le slad. San uair oirbheartach seo is é dualgas náisiún na hÉireann a chruthú, lena misneach agus lena dea-iompar agus le toil a clainne á dtoirbhirt féin ar son na maitheasa poiblí, go dtuilleann sí an réim ró-uasal is dán di.